National/Team Estrade//– Jet Airways has received its fifth Boeing 737 MAX, as part of its fleet modernization plan in line with its commitment to offer its guests a considerably superior and differentiated flying experience. Since the induction of the airline’s maiden 737MAX (registered as VT-JXA) on 28th June, 2018, another four have joined its fleet. The latest MAX – the airline’s fifth, with registration VT-JXE – is part of 11 MAX aircraft that Jet Airways will be inducting this fiscal year. Another 220 MAX aircraft are expected to join the airline’s fleet over the course of the next decade, as it expands its footprint and refreshes its in-flight experience on the back of a completely modern and contemporary product. Jet Airways remains the first and only Indian carrier to operate these advanced single-aisle fuel-efficient aircraft in the Indian skies. 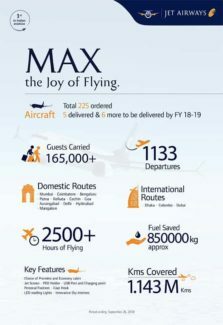 Jet Airways’ 737 MAX is replete with numerous features that provide guests with a truly delightful flying experience. Guests stepping onboard the new MAX are greeted by a customizable and an eye-catching Sky Interior featuring modern-sculpted sidewalls, anti-glare LED lighting and other appealing improvements to both form and function. Redesigned overhead bins enable larger and convenient storage space for cabin baggage, facilitating faster boarding and on-time departure. Like the 737NG, the 737MAX offers a two-class configuration of two variants. One comprising 12 Première and 162 seats in Economy, and another with 12 Premiere and 156 Economy class seats. Premiere seats are equipped with in-built USB ports, laptop chargers, portable electronic device holders and a generous legroom for an appropriate mix of productivity and comfort. Economy guests can also enjoy extra-wide seats with easy recline, USB ports, portable electronic device holders as well as coat hooks emphasizing the sense of empowerment and convenience.